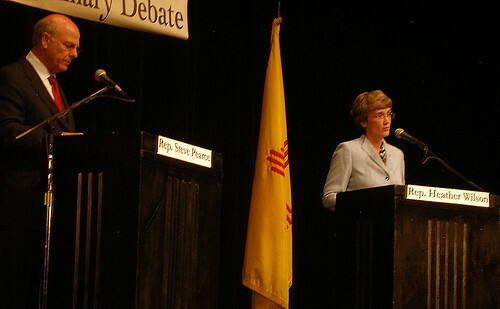 I'm late posting this, but my coverage on the Heather Wilson/Steve Pearce debate in Los Alamos Friday night is HERE. While a lot of Democrats are getting depressed over the neverending Obama Clinton battle, at least in New Mexico Dems can take heart that in this state two major Republicans are happily ripping into each other. But will this heated debate fester into an animosity that will hurt the GOP through the general election? As Brian Sanderoff told me a couple of weeks ago, once the primary is over, so much national party money on both sides is going to pour into the state for the Senate race alone, it'll even things out somewhat.